Saturday March 17 Wobby.club and Tilt teamed up for Tilt Festival, the biggest literary festival of the South of the Netherlands. Wobby.club made special program segments full of images and stories.The new issue of Wobby, number 13 was launched, themed 'intiem' (intimate). A week before the Tilt festival night Wobby.club and Tilt were present at the Saturday market in Tilburg during Straat op Tilt. People could get a free and fresh screen printed tote bag or t shirt with illustrations by Jan Hamstra, Eva Stalinski and Jeroen de Leijer (text by Wobby.club). During the festival night 'Strip professor' Joost Pollmann interviewed artists Michiel van de Pol, Lukas Verstraete and Bobbi Oskam about their work. All three artists provided new work for Wobby #13. Wobby.club also hosted the live radio show Radio WobTit. 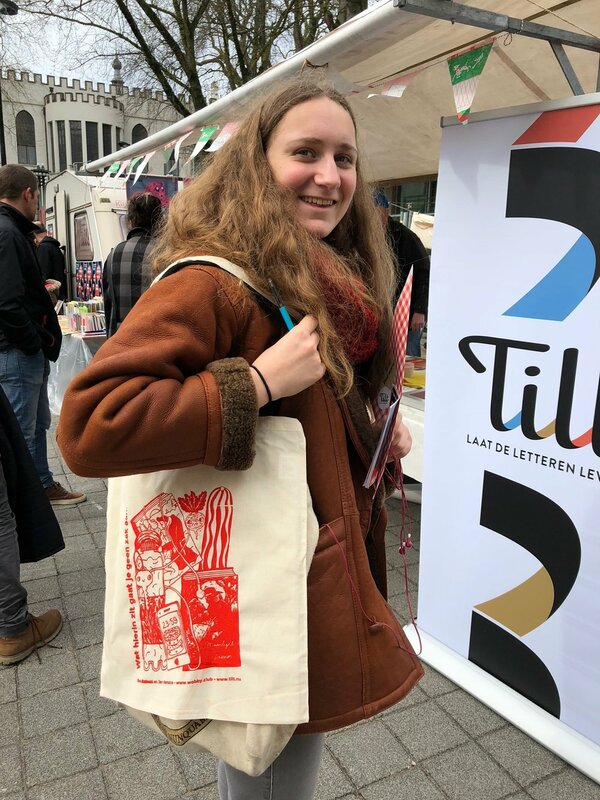 During the festival night the multi talented print crew Jan Hamstra and Eva Stalinski, screen print heroes from Groningen, supplied the audience with free tote bags.